I grew up in Southern California where most of my family still lives, after serving 2 years as a Marine I relocated to Las Vegas and spent 25 years working there as an industrial engineer, with the last 3 years working for a gaming company as the Chief Engineer for one of their properties. In August of 2012 my wife and I moved to the Cusco region of Peru, where we now live and operate a bed and breakfast in the small town of Huarocondo called GringoWasi. Please check out our website. You can also reach me via email. Feel free to contact us with any questions you may have on the Cusco region, and we will do our best to answer them. Well actually semi-retirement, my wife and I moved to the Cusco region here in Peru in August of 2012 to run a bed and breakfast, and prior to making this move we were living in Las Vegas. I was working for a large gaming company as the Chief Engineer for one of their properties, and my wife Lily was working for a bank as an account specialist. While we both enjoyed our careers, we had started to grow weary of the daily grind, and Lily was starting to have back problems, this led to her having to quit her job, as she was unable to sit all day. Considering the state of the job market, the possibility of her being able to start a new career did not look all that promising, so this combined with the fact that it was difficult to make ends meet with just my income alone, is what prompted the big change, as Lily is Peruvian it made sense to look into moving to Peru. While most ex-pats settle in Lima, we were not interested in leaving Las Vegas just to live in another big city, so we looked around for smaller towns that would have a more relaxed pace and discovered Huarocondo. This small town is nestled in a valley about 30 minutes west from the city of Cusco, it is largely an agricultural area with farms throughout the valley, and these farms grow a variety of crops including corn, potatoes and quinoa. I think Huarocondo is about as opposite as you could get from Las Vegas, it is small, quiet, the hills are green and it has no traffic, well unless you come across a farmer taking their livestock out to the fields. Personally I don’t mind having to wait for some Cows or sheep to cross the street, it is much better than sitting on a freeway in 110 degree heat for a ½ hour, because some idiot was in a big hurry and caused an accident. While we have found the Cusco area to be quit enjoyable, it would definitely not be for everyone, and while we found many pros, there are also a few cons that would have to be considered as well. First and most important is the altitude which is 11,300 feet. According to a recent study most visitors (82.9%) will experience nothing more than mild AMS (acute mountain sickness), with only 17.1% of visitors experiencing severe AMS. While AMS is definitely something to be considered, the good news is that it is only a risk for the first few days, after that your body will acclimate and any risk of AMS goes away. The fact that the air is thin will always be there, even after living here for over a year, we still get out of breath easily when exerting ourselves. 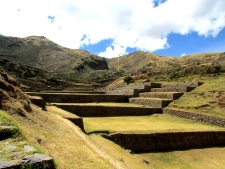 Another thing to consider in the Cusco area is the lack of North American amenities. Due to the large ex-pat communities in Lima, many North American amenities are available. There are chain restaurants that everyone knows like Chili’s, McDonald’s, and Pizza Hut to name a few, as well as large shopping malls and movie theaters. But here in Cusco you will find almost none of these things. While there is a McDonald’s and Starbucks in Cusco, we don’t have any malls or movie theaters yet. As a matter of fact if you want to watch a movie the only thing you will find here are pirated copies. Legal copies of movies just don’t exist. While some may find other downsides to our area, those are the only two that I can think of. We have not had a need yet for medical care but it is readily available. We have a small clinic here in town and there are several large Hospitals in Cusco, that provide good to excellent care depending on which one you go to. One of the positives of Cusco and maybe Peru in general is the medical care. Medical care is inexpensive as is insurance. Our son, who is a professional skateboarder in Lima, has medical insurance that covers just about everything and it only costs about $130 USD a year. Thank you for your informative post. I am thinking of retiring in Peru and am looking for visa information as well. Are you able to stay because of your business? I’m from Seattle area and now working in Arequipa for the last 3 months with 15 more to go and I would like to explore the idea of an early retirement with my wife in Cusco after I finish this project. 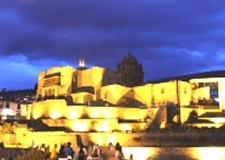 I’ve heard nothing but excellent reports from those that have been to Cusco and we plan to go there in April. My question is about how much as a percentage does it cost you to live in Cusco versus Vegas? I’m guessing in the range of 60-65%. Also, how confident are you in the health care there? Lastly, do you feel as safe in Cusco as Vegas? Nowadays with the currency devaluation might be even cheaper. In particular I cant imagine huarocondo to be expensive, have been there one of my best friends run the biggest farm there. Harocondo 100% safe…little town usually don’t have crime or if it exists is small non violent. In cusco downtown, I would say is safe, but you have to know what streets you go on. Is not swistezerland; but even there there is always some bad street. cuzco, because of the amount of tourism might be a bit more expensive. but it all depends how much downtown you want to be. I served as a Peace Corps Volunteer several years ago and was stationed in the Department of Cuzco, a small town called Checacupe and later was assigned to work in the City of Cuzco where I lived for almost two years. I loved living in the city so close to the center and I got to know the area quite well. Also 44 years ago I married my wife of 44 years. She was born in Yucay and lived in Cuzco for most of her life. thus we have quite a few relatives there for sure. > It would be awesome to spend part of our retirement there but I am not sure of access to the medical resources I need, especially for diabetes, i.e. insulin etc. If nothing else long term at least like three months or so yearly. > What would you suggest we consider? Sorry everyone, looks like I have not gotten all of the notices that there were comments, I know some of these are old but I will answer anyway for reader reference. @Kathleen – I am able to stay because my wife is Peruvian. @Ron – I hope you enjoyed your trip to Cusco. I have never really tried figuring out just how much cheaper it is to live here but here are a few figures for reference. My property taxes are about $35.00 a year, Water is $3.00 a month, Power about $60.00 a month, and a $13.00 bottle of propane lasts us about 3 months. While some things like Cars and Gas are about the same as in the US, everything else is so much cheaper so it is probably costing us at least 75% less to live here. While the government health care system may be marginal, there are clinics that offer excellent care at a very reasonable rate, the end of last year my wife broke her leg (both tibia and fibula), 3 days in the clinic and surgery (plate and screws for the leg) was only about $1,600.00 with no insurance. As for safety, I feel safer here than when I lived in Vegas. @Jaime – I haven’t been to Checacupe yet, but I know where it is. You shouldn’t have problems with medical care, there are several good clinics and the government is building a new hospital that looks like it will be very nice. I would consider an exploratory trip first, come for a few weeks or so, check out the medical services and find a doctor you like, if you find the medical services good then plan a longer visit after that. Have lived and grew up outside North America for 45 yrs in 62 countries and the Cuzco area would be great to get away from the present world.